Vasarely received his artistic training at the Podolini-Volkmann Academy (Budapest, 1927) and Műhely (Budapest, 1929), a school of applied arts subscribed to the principles of the Bauhaus under Alexander Bortnyik’s guidance. During his student years he made a living as a designer of advertising posters. His drawings evolved from realism to synthetic geometric patterns using optical effects based on the overlapping of lines. In 1930 he moved in Paris where he achieved great success as a poster designer. With the idea of opening a school in the style of the Bauhaus he pursued systematic studies of the means of graphic representation including those related to optical effects, which would be of great importance in his work later on. Although his discoveries were motivated by his pedagogical goals they became the “alphabet” and “basic repertoire” (in the words of the artist) of his later work. Between 1942 and 1944 he lived away from Paris due to World War II. He temporarily abandoned the graphic arts and dedicated himself the study and practice of modern painting. In 1944 the Galerie Denise René (Paris) opened with a solo exhibition of Vasarely featuring drawings, graphics and poster studies. In 1946 a new exhibition at the same gallery presented pictorial studies inspired by Cubism and Surrealism. A year later he rejected these works and made the decision to fully devote himself to constructivist and abstract-geometric art. The first step towards abstraction occurred in 1947 during a stay in Belle-Isle. Inspired by the environment, Vasarely painted landscapes in which natural figures were reduced to geometric shapes. In 1948 he purchased a house in Gordes, a medieval town whose tangle of houses inspired the Gordes series—abstractions of walls, roofs and the skies. Influenced by the Gestalt theory Vasarely explored the ambiguity between form and substance in the Gordes series in which the forms built from an axonometric perspective gave a sort of imprecise spatial perception. In 1951 Vasarely settled in Arcueil. Where he discovered strange shapes on the tiles of the station Denfert-Richereau that inspired the series Denfert. In these works the compositional center disappeared and the shapes, although in reduced number and color, covered the entire canvas. The ambiguity of the elements (shape, color, light, shadow) was emphasized. The work that sums up this period in Vasarely’s evolution is Hommage à Malevich (first version, 1952). The unsymmetrical structure of the work, with large squares and diamonds of perfect shape inscribed in other squares and diamonds whose sides do not join, gives the forms a misleading spatial location: at times they seem to escape from the surface and at times they sink into it. The diamond figure, meanwhile, looks like a rotating square. In 1951 Vasarely exhibited the Photographismes series at the Galerie Denise René, which consisted of photographic enlargements of drawings of white lines on black background or vice versa. When the lines were closer together they produced a vibrant effect. His study of optical phenomena in the work of art led him to organize the group exhibition Le mouvement (Galerie Denise René, 1955) that launched Kinetic Art. Vasarely presented Deep Kinetic Works, two sheets of transparent Plexiglas with line drawings placed parallel to each other and spaced five centimeters apart. The movement of the observer produced constant transformation of the work. Coinciding with this exhibition, Vasarely published the Yellow Manifesto declaring the formal and social concepts of kinetic art. In the Noir et blanc series overlapping shapes are tightly packed so that structures intersected to give rise to a visual rhythm. The “plastic units” consisted of squares with different geometric figures inscribed in their inside to be combined in series. The first works produced with this principle dated from the mid-50s and were restricted to black and white. Over time Vasarely added contrasting colors to each of the forms. In 1959 Vasarely patented the “plastic unity” and, in 1963, he presented the exhibition Unité Plastique (Musée des Arts Décoratifs, Paris). The series Folklore Planétaire had a limited chromatic repertoire and a structure that repeated itself in a complex progressive sequence. Later, in the Permutations series, the chromatic repertoire expanded and the figures that made up the “plastic units” were sometimes distorted to create spatial effects. Another application of the “plastic units” was the reproductive model. Following a pattern designed by Vasarely, shop assistants were able to produce the artwork. This was the realization of his ideal of democratization of the artistic creation and his way of rejecting the idea of the original work of art and the notion of the individuality of the individuality of the artist. In the second half of the 60s Vasarely was lionized as a precursor of Op Art. He participated in all major international group Op Art exhibitions including The Responsive Eye (Museum of Modern Art, New York, 1965) and Lumière et mouvement (Musée d’Art Moderne de la Ville de Paris, Paris, 1967). By this time he was studying how to produce a great illusion of unstable three-dimensionality using the cube (sometimes axonometric, sometimes Kepler). The research ended with his greatest achievement, the Tridim series. The next step was to produce real three-dimensional objects (in which the “plastic unit” could become a real cube) generically known as Bidim. During the following decades Vasarely was mainly devoted to spreading his legacy. Highlights of this period were the implementation of his ideas about architectural integration at the headquarters of the Vasarely Foundation in Aix-en-Provence (opened in 1976). From the façade to the interior of the building there were more than fifty works integrated into the architectural space. The artist, always looking to create a more beautiful and welcoming urban environment, produced numerous monuments from 1954 on, when he participated in the project of integration of the arts carried out by the architect Carlos Raul Villanueva at the Ciudad Universitaria de Caracas, Venezuela, where he successfully applied the idea of turning the “plastic unit” into a sort of architectural module. Albrecht Schröder, Klaus (ed.). Victor Vasarely. Vienna: Kunstforum, 1992. Blomstedt, J. Vasarely. Helsinki, 1960. Brück, A. Vasarely – Analysen. Hamburg, 1970. Dahhan, B. Victor Vasarely ou La connaissance d’un art moléculaire. Paris, 1979. Diehl, Gaston. Victor Munich-Budapest, 1972. Paris, 1973. Bindlach, 1993. Ferrier, Jean-Louis. Entretiens avec Victor Vasarely. Paris, 1969. Holzhey, Magdalena. Cologne: Taschen, 2005. Gassen, Richard (ed.). Victor Vasarely – Erfinder der Op Art. Ludwigshafen am Rhein-Wolfsburg-Bottrop, 1997. Joray, M. et al. (eds.). Vasarely, vols. I-IV. Neuchâtel: Éditions du Griffon, 1965-1980. Knierim, R. Vasarely und der Konstruktivismus. Bochum, 1978. Motte, Manfred de la y Tolnay, Alexander (eds.). Vasarely: Werke aus sechs Jahrzehnten. Esslingen, 1986. Reinhardt, Brigitte. Vasarely: Geometrie Abstraktion Rhytmus. Die fünfziger Jahre. Ulm: Ulmer Museum, 1998. Schmied, W. Victor Vasarely. Wegebereiter zur Modernen Kunst. Hannover, 1967. Schröder, K.A. (ed.) Victor Vasarely. Kunstforum Wien der Bank Austria, Vienne. Munich, 1992. Spies, Werner. Teuffen, 1969. New York, 1971. Spies, Werner. Victor Vasarely. Cologne, 1958 y 1971. Vasarely, Victor. Gäa – Bilder und Meditationen. Paris, 1982. Vasarely, Victor. Notes brutes. Paris, 1972. Vasarely, Victor. Plasticité. Paris, 1969. Victor Vasarely inconnu. Neuchâtel, 1977. 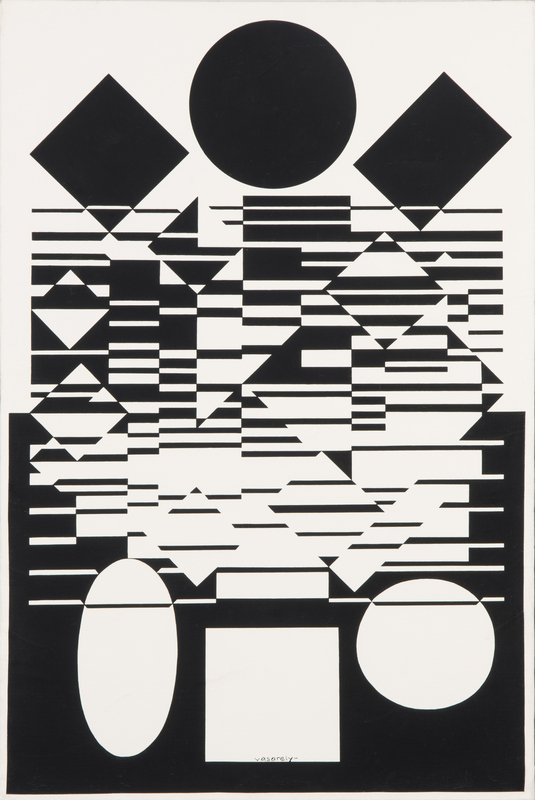 Weikert, H. Victor Vasarely. Begegnung mit Kunstwerken. Munich, 1971.